Having a Gender Reveal Party? Then look no further than our awesome new Gender Reveal Inflatable, simply you and your partner pull down the flap either side and it will release Pink/blue balloons or balls (your choice) to announce the Gender of your baby. There is also a sign inside saying it's a boy or it's a girl. 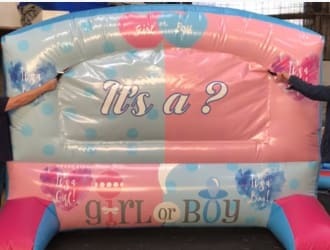 Hire this completely different and novel inflatable for your reveal party and once the baby is born then you will get an amazing lifetime 10% discount for every Birthday Party your child has with Riviera Events and we'll even give you a bonus 10% discount for their Christening.